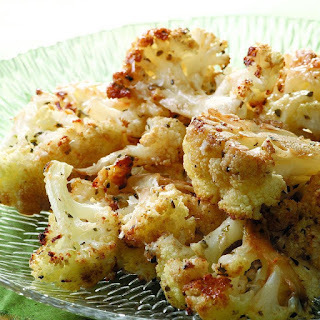 Combine cauliflower, olive oil, lemon juice, garlic, salt and pepper well so all the florets are coated and seasoned. Place in a large shallow roasting pan and place in the center of the oven. Roast for about 25-35 minutes, turning florets occasionally so they are evenly cooked. Remove from oven and top with cheese and some lemon zest and additional salt and pepper if needed.